The Salt Lake Stallions is a professional American football team based in Salt Lake City, and one of the charter members of the Alliance of American Football (AAF), which began play in February 2019. The Stallions are the northernmost team in the AAF, as the league's only franchise north of the 35th parallel. The team's head coach is Dennis Erickson, who has a 179–96–1 record coaching college football and a 40–56 record coaching in the NFL. The Alliance of American Football (AAF) is a professional American football league, founded by Charlie Ebersol and Bill Polian. 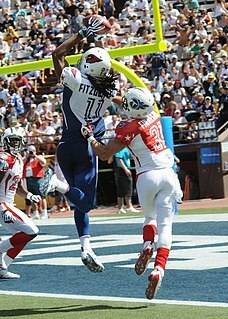 The AAF consists of eight centrally owned and operated teams, all in the southern and western United States. All teams except Birmingham are located in metropolitan areas that have at least one major professional sports franchise. Ashland is a city in and the county seat of Ashland County, Ohio, United States, located 66 miles southwest of Cleveland and 82 miles northeast of Columbus. The population was 20,362 at the 2010 census. It is the center of the Ashland Micropolitan Statistical Area. Loudonville High School is a high school in Loudonville, Ohio. It is the only high school in the Loudonville-Perrysville Exempted Village School District. However, younger students attend one of three schools. 1st- 3rd graders attend the R.F. McMullen School, then cross the street to attend the C.E. Budd School for grades 4-6. Then, students attend the high school campus for 7th and 8th grades. The school colors are maroon and gray, though the sports teams wear red and the gray color changes from white, silver or gray. Controversy has appeared with using the color black. There are approximately 450 students currently enrolled in Loudonville High School. Loudonville is the hometown of football coach Ron Zook, currently the Special Teams Coordinator for the Green Bay Packers. Zook graduated from LHS in 1972. Orrville High School is a public high school in Orrville, Ohio. It is the only high school in the Orrville City School District. The school nickname is the Red Riders. Orrville is a city in Wayne County, Ohio, United States. It is about 9 miles east of Wooster and 20 miles southwest of Akron. The population was 8,380 at the 2010 census. A graduate assistant is a person who serves in a support role (assistantship) at a university, usually while completing post-graduate education. The individual typically assists professors with instructional responsibilities as teaching assistants or with academic research responsibilities as research assistants, aids coaches with an athletic team, or is employed by other university departments. The 1991 Florida Gators football team represented the University of Florida during the 1991 NCAA Division I-A football season. 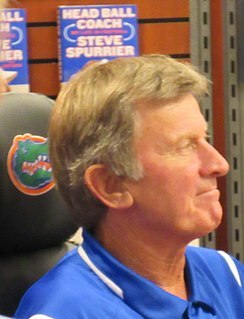 The season was Steve Spurrier's second as the head coach of the Florida Gators football team. The Gators were led by quarterback Shane Matthews and first-team All-American defensive tackle Brad Culpepper. Stephen Orr Spurrier is a former American football player and coach often referred to by his nickname, the "Head Ball Coach". Steve Spurrier was born in Miami Beach, Florida and grew up in Tennessee, where he was a multi-sport all-state athlete at Science Hill High School in Johnson City. He attended the University of Florida, where he won the 1966 Heisman Trophy as a college football quarterback with the Florida Gators. The San Francisco 49ers picked him in the first round of the 1967 NFL draft, and he spent a decade playing professionally in the National Football League (NFL), mainly as a backup quarterback and punter. Spurrier was inducted into the College Football Hall of Fame as a player in 1986. Florida defensive coordinator Bobby Pruett left to become the head coach at Marshall University in January 1995 and Zook was promoted to take his place, becoming Florida's defensive coordinator once again. However, the NFL's Pittsburgh Steelers offered Zook the job of special teams coordinator just one month later and he accepted, leaving the college game for a time. With Zook leaving, Bob Stoops was brought in to run Florida's defense. Robert Lewis Pruett is a former American football player and coach. He served as the head football coach Marshall University for nine seasons, from 1996 to 2004. During his tenure at Marshall, the Marshall Thundering Herd football team compiled a record of 94–23, completed two undefeated seasons, won six conference championships, won five of seven bowl games played, and captured the NCAA Division I-AA Football Championship in 1996. Pruett has coached many high-profile National Football League players, including Randy Moss, Chad Pennington, and Byron Leftwich. In 1999, he was inducted into the Marshall University Athletics Hall of Fame for his collegiate career in football, track and field, and wrestling. 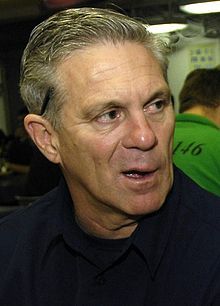 After leaving Florida, Zook served three seasons as special teams coach for the Pittsburgh Steelers, then was the defensive backs coach for the Kansas City Chiefs in 1999. In the 2000 and 2001 seasons, Zook served as the defensive coordinator for the New Orleans Saints. In 2000, the Saints finished 10–6 with Zook's defense ranking 10th in points allowed. DT La'Roi Glover led the team with 17 Sacks followed by 12 from DE Joe Johnson and 11 by DE Darren Howard. In January 2002, Steve Spurrier resigned from Florida to explore head coaching opportunities in the NFL, eventually signing with the Washington Redskins. Florida athletic director Jeremy Foley sought to replace him with either Denver Broncos coach Mike Shanahan or Oklahoma's Bob Stoops, but each decided to remain with their respective teams. Foley's next choice was Zook, who accepted the job. Given the success of Spurrier's 12-year tenure, expectations at Florida were high, and seemingly "settling" for Zook as the Gators' new coach was not popular with many students and supporters. Others did not understand why the university would hire a man who was demoted as a coordinator on the same staff to be head coach. Within a day of Zook's hiring, one fan started a website called FireRonZook.com that gained national media attention. Many fraternity houses hung banners from week to week either praising Zook or calling for his firing. Zook was head coach at Florida for three seasons. The Gators compiled records of 8–5 (2002), 8–5 (2003) and 7–5 (2004). While Zook's tenure saw modest success, it was well short of what Gator fans had come to expect. In his three seasons, the Gators lost six games at Ben Hill Griffin Stadium. By comparison, Spurrier lost only five home games in 12 years. Many of the losses were fourth quarter comebacks by the opposition, causing many fans to question the prevent defense which was employed. Zook did not beat a ranked opponent at home during his time at Florida. Zook was fired before the end of the 2004 season after a 38–31 road loss to the Mississippi State Bulldogs (who were 1–5 prior to the game, including a home loss to Division I-AA Maine). He had not helped his cause by getting into a heated argument with several fraternity members a few weeks earlier after being called in to defuse a dispute between the brothers and his players. Zook finished the regular season, but did not coach the Gators in the Peach Bowl because he had already accepted the head coach's job at Illinois. Defensive coordinator Charlie Strong coached the Gators in the Peach Bowl. After Zook's departure, his successor Urban Meyer won a national title in 2006, largely with players whom Zook had recruited. Despite his team's past struggles, Zook improved the ability of Illinois to recruit top football talent. According to one source, the 2006 recruiting class was one of the 30 best in college football. Despite this, they finished the 2006 season 1–7 in the conference and 2–10 overall. While the record did not improve, the play on the field did as the Illini nearly upset top ranked Ohio State in Champaign before losing 17–10. Additionally, the Illini played well against Iowa, Wisconsin, and Penn State (they lost 63–10 the year before; Penn State led 56–3 at halftime) but ended up losing close games (they were down 15–12 at Penn State until Penn State broke open the close game to make it 26–12). On November 20, 2007, Ron Zook was selected as the Big Ten Coach of the Year. Zook also was awarded the Liberty Mutual Coach of the Year Award following the 2007 season. After making the 2008 Rose Bowl, Illinois was squashed, 49–17, by the USC Trojans, putting a bit of a damper on an otherwise great season. At the end of the 2009 season, offensive coordinator Mike Schultz was released from his contract,  and co-defensive coordinators Dan Disch and Curt Mallory were demoted to position coaches. Illinois hired Paul Petrino as offensive coordinator, and Vic Koenning as defensive coordinator. In 2014, Zook was hired by the Green Bay Packers to the position of assistant special teams coordinator. He was not retained by the team after the 2018 season.  .
1 2 Zook left for Illinois after the regular season; defensive coordinator Charlie Strong coached Florida in the Peach Bowl. Florida credits the regular season to Zook and the Peach Bowl to Strong. 1 2 Zook was fired at the end of the regular season; defensive coordinator Vic Koenning was appointed as interim head coach and coached Illinois in the Kraft Fight Hunger Bowl. Illinois credits the regular season to Zook and the Fight Hunger Bowl to Koenning. Nathaniel Donnell Abraham is an American football coach and former cornerback who currently serves as the defensive backs coach for the Orlando Apollos of the Alliance of American Football (AAF). In his career, he played for the Tampa Bay Buccaneers (1996–2001) and the New York Jets (2002–2004). Lou Tepper is an American football coach and former player currently serving as defensive coordinator of the Buffalo Bulls. Previously, he was the head football coach at Indiana University of Pennsylvania (2006-2010), the University of Illinois at Urbana-Champaign (1991–1996) and Edinboro University of Pennsylvania (2000–2005). He was the defensive coordinator at Louisiana State University from 1997 to 1999. Charlie Rene Strong is an American football coach and former player. Strong is currently the head coach at the University of South Florida. Strong held numerous assistant coaching positions before becoming a head coach at the University of Louisville in 2010. During his four-year stint at Louisville, he led the Cardinals to a 37–15 record and reached a bowl game each season, including the 2013 Sugar Bowl. After the 2013 season he left Louisville to become the head coach at the University of Texas. He was fired by Texas after the 2016 season with a 16–21 record in three seasons. One month after leaving Texas, Strong was hired at South Florida. Victor Emanuel Koenning Jr. is a former professional American football player, and currently serves as the defensive coordinator at West Virginia University. He was recently defensive coordinator at Troy University. He was the interim head coach at the University of Illinois at Urbana–Champaign in 2011 and was the head football coach at the University of Wyoming from 2000 to 2002, where he compiled a record of 5–29. The 2005 Florida Gators football team represented the University of Florida in the sport of American football during the 2005 college football season. The Gators competed in Division I-A of the National Collegiate Athletic Association (NCAA) and the Eastern Division of the Southeastern Conference (SEC), and played their home games at Ben Hill Griffin Stadium on the university's Gainesville, Florida campus. The season was the team's first of six under head coach Urban Meyer, who led the Gators to an Outback Bowl berth and an overall win-loss record of 9–3 (.750). The Florida–Florida State football rivalry, occasionally called the Sunshine Showdown, is an American college football rivalry between the teams of the two oldest public universities of the U.S. state of Florida: the University of Florida Gators and Florida State University Seminoles. Although both universities participate in a range of intercollegiate sports, the competition between the Gators and the Seminoles has most often focused on football. The 2004 Florida Gators football team represented the University of Florida in the sport of American football during the 2004 NCAA Division I-A football season. The Gators competed in Division I-A of the National Collegiate Athletic Association (NCAA) and the Eastern Division of the Southeastern Conference (SEC), and played their home games at Ben Hill Griffin Stadium on the university's Gainesville, Florida campus. The season was the third and last for head coach Ron Zook, who led the Gators to a regular season record of 7–4 (.636). The Florida–Tennessee football rivalry, sometimes referred to as the "Third Saturday in September", is an American college football rivalry between the Florida Gators football team of the University of Florida and Tennessee Volunteers football team of the University of Tennessee, who first met on the football field in 1916. The Gators and Vols have competed in the same athletic conference since Florida joined the now-defunct Southern Intercollegiate Athletic Association in 1910, and the schools were founding members of the Southeastern Conference in 1932. Despite this long conference association, a true rivalry did not develop until the early 1990s due to the infrequency of earlier meetings; in the first seventy-six years (1916–91) of the series, the two teams met just twenty-one times. The Southeastern Conference (SEC) expanded to twelve universities and split into two divisions in 1992. Florida and Tennessee were placed in the SEC's East Division and have met on a home-and-home basis every season since. Their rivalry quickly blossomed in intensity and importance in the 1990s and early 2000s as both programs regularly fielded national championship contending teams under coaches Phil Fulmer of Tennessee and Steve Spurrier at Florida. The 1966 Florida Gators football team represented the University of Florida in the sport of American football during the 1966 NCAA University Division football season. The Gators competed in the University Division of the National Collegiate Athletic Association (NCAA) and the Southeastern Conference (SEC). In their seventh season under head coach Ray Graves, the Gators compiled a 9–2 overall win-loss record, finished 5–1 and placed third among the SEC's ten teams. Led by quarterback Steve Spurrier, the Gators outscored their opponents by a combined total of 265 to 147 and concluded their 1966 season with a 27–12 victory over the Georgia Tech Yellow Jackets in the 1967 Orange Bowl. The Gators were not ranked in the final AP Poll, but finished No. 11 in the final UPI Coaches Poll. The 1990 Florida Gators football team represented the University of Florida during the 1990 NCAA Division I-A football season. The season marked the return of the Gators' Heisman Trophy-winning quarterback Steve Spurrier to his alma mater as the new head coach of the Florida Gators football team. Jerry D. Anderson, also known by his nickname "Red Anderson," is an American former college football player and coach. Mike Mallory is an American football coach and a former player who currently works as assistant special teams coordinator for the Jacksonville Jaguars of the National Football League (NFL). He played college football as a linebacker for the University of Michigan from 1982 to 1985. He was the Most Valuable Player for the 1984 Michigan team and was a finalist for the Butkus Award in 1985. Since 1986, he has been a college football coach, including stints as the defensive coordinator for the Rhode Island Rams (1993–1995), Northern Illinois Huskies (1996–1999), Illinois Fighting Illini (2004–2005). He was also the assistant special teams coach of the New Orleans Saints from 2008 to 2012. Michael Anthony Locksley is an American football coach. He is currently the head coach for the University of Maryland football team and former offensive coordinator for the University of Alabama. After serving as an assistant coach for several college football squads, he became the 29th head coach of the University of New Mexico Lobos football team in 2009. Locksley was fired on September 25, 2011 after going 2–26. The 2009 Illinois Fighting Illini football team represented the University of Illinois during the 2009 NCAA Division I FBS football season. The team's head football coach was Ron Zook. The Illini played their home games at Memorial Stadium in Champaign, Illinois. This was Ron Zook's fifth season as the Illini head coach. The Illini finished the season 3–9. The Illini failed to live up to the lofty preseason expectations, receiving almost enough votes in the AP Poll to be ranked, and even were considered a dark horse candidate for the Big Ten championship. But after their blowout loss to Missouri, they failed to receive any votes, and failed to show any improvement until the Michigan State game, which followed blowout losses to Penn State and Ohio State, but by late in the season, they were able to upset Michigan and Minnesota while also giving Cincinnati a game. The 2011 Illinois Fighting Illini football team represented the University of Illinois at Urbana–Champaign in the 2011 NCAA Division I FBS football season. The Fighting Illini, who were led during the regular season by seventh-year head coach Ron Zook, are members of the Big Ten Conference in the Legends Division and played their home games at Memorial Stadium. Zook was fired after the team lost the final six games of its regular season. Defensive coordinator Vic Koenning was appointed as interim head coach led the team in the Kraft Fight Hunger Bowl. On December 9, Illinois hired Tim Beckman as their new permanent head coach. ↑ "Jacquelyn Paige Zook". Amarillo Globe-News. April 16, 2011. Retrieved December 26, 2014. ↑ "Former Florida coach Ron Zook to join CBS Sports Network as college analyst". Tampa Bay Times. ↑ "Signs point to Ron Zook as new Packers special teams coach". ↑ Dooley, Pat (January 20, 2002). "Zook Suits Gators Just Perfect". Lakeland Ledger. Archived from the original on February 9, 2002. ↑ "Gainesville Sun – Google News Archive Search". news.google.com. ↑ "Sarasota Herald-Tribune – Google News Archive Search". news.google.com. ↑ "Times Daily – Google News Archive Search". news.google.com. ↑ "2000 New Orleans Saints Statistics & Players - Pro-Football-Reference.com". Pro-Football-Reference.com. ↑ "Gators Fire Zook, Keep Spurrier in Mind (washingtonpost.com)". www.washingtonpost.com. ↑ "USATODAY.com – Colleagues, players stick up for Florida's Zook". usatoday30.usatoday.com. ↑ ESPN News Services, "With Zook out, will Spurrier get a call?" ESPN.com (October 26, 2004). Retrieved September 8, 2009. ↑ "2006 Football Team Rankings". Scout. ↑ "NFL, College Sports, NBA and Recruiting". scout.scout.com. ↑ "High School Confidential". Archived from the original on November 6, 2007. ↑ "Illinois' strong start earns Ron Zook extension, raise - USATODAY.com". www.usatoday.com. ↑ "Chicago Sports News, Schedules & Scores – Chicago Tribune". ↑ "Coach of the Year". www.coachoftheyear.com. ↑ "Illinois hiring Paul Petrino as offensive coordinator". ↑ "Former Illinois coach Zook delves into TV, banking". ↑ "Ex-college coach Zook joins Packers' staff". ↑ Jones, Brian (February 28, 2019). "Ron Zook joins Salt Lake Stallions coaching staff". 247Sports.com . Retrieved February 28, 2019.